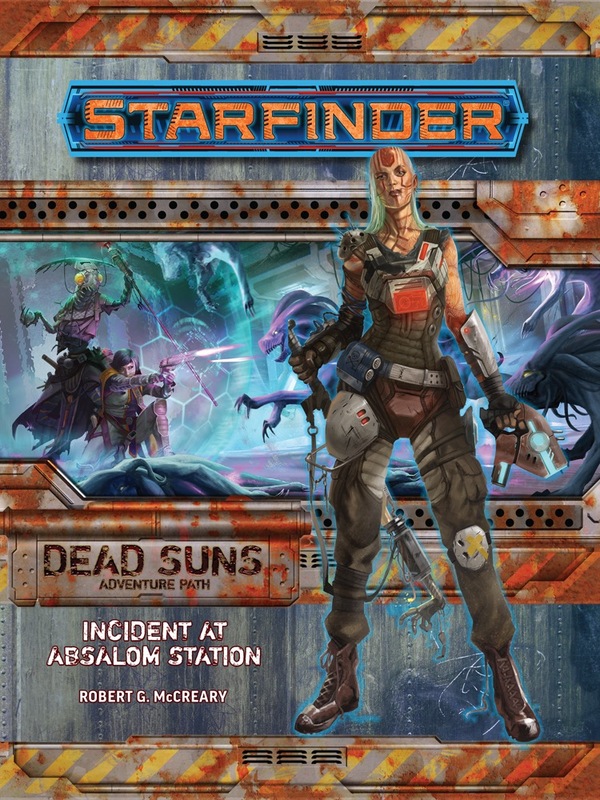 Incident at Absalom Station is sanctioned for use in Starfinder Society Roleplaying Guild. Basics- ARE YOU READY FOR ADVENTURE!? Incident at Absalom Station kicks off the first Starfinder adventure path. Players step off the ship and into gangland warfare as their contact is gun downed within seconds of seeing him. Why? What dark secrets are at play? Who is involved? Also, this book contains a gazatier on Absolom station, several new monsters, and a whole new world for your players to play in. There is a lot of good content in this adventure, but some major issues. It does a good job of introducing the setting and gives you a chance to uses some of the unique starfinder rules. The major down side is that there is one fight that is so incredibly hard that it almost guaranteed to kill a PC, if not all of them. Additionally, there is some major rail-roading (see spoiler for details). The ambassador gives the PCs a robot to record their exploits. The ambassador then broadcasts the robots footage to Absalom Station to make the PCs celebrities. Many of the PCs may not want to be celebrities, but they don’t get a choice. Even if they disabled the robot early on, the adventure says that the ambassador put a hidden tracking device on the PCs. A tracking device that the PCs never get any kind of check see being planted or find later. This would be forgivable if their celebrity status was a major plot point that needed to happen, but despite a little bit of mention in the beginning of book 2, this plot point is quickly dropped and forgotten. Classically glamorous + mechanically ambitious = good fun! This is a classic sci-fi adventure, with a modern twist towards the end, and perfectly crafted. We just started it and I am enjoying preparing it thoroughly as a GM. My players are loving it, will wait to hear their final impressions on it. Starfinder is looking daaaam good. P.s. : I've seen a number of low ratings... I don't understand most of them, they seem to have very weird unmet expectations. Nice adventure, if you set aside the fact that level 1 PCs are recruted for this crucial task. The end is the weak part. It's a space dungeon. Fine with that. But it's horribly designed, as if casting aside decades of dungeon design. The rooms are barren, minuscule (go fit a sniper in a 25' room! ), and often bypassable. Also, it's just fight after fight with no interesting way to affect them - eventhough some are ripe for social, mystical or technical interaction; would have been a good way to mitigate their difficulty. Also, as usual, zero effort put to mitigate repeated rests. There's basically nothing that prevents the heroes from sleeping it out after each encounter. Loot is also very weird. There's salvageable stuff in unexpected places (e.g. a bar), and none in others (a filled cargo hold). Incident at Absalom Station can best be summed up as serviceable but dry. All the necessary bits and pieces are in place and the adventure does a good job of providing a variety of both combat and skill challenges. But the adventure as written lacks the vibrant characters, varied combat scenarios and absorbing plots that I've come to appreciate and expect from Paizo's Pathfinder AP line. Poor motivation in-character: PCs are often doing things for purely mercenary reasons rather than in response to a dramatic event that motivates them both in and out of character. PCs have no attachment to Duravor (he dies before they know him), subsequent events are all just 'jobs' the party agrees to do. Relies heavily on PCs wanting to join the Starfinder Society in part 1, but the Society is hardly involved in parts 2 and 3. It also does a poor job of showing in-setting why it would be worth joining the Society. No Player Guide means poor context: Without a Player's Guide, Player Characters are not well integrated into the setting. Players don't have background knowledge/context necessary to interact richly with the melting pot that is Absalom Station. This is a new setting and one without traditional fantasy elements to fall back on to do the heavy lifting. It REALLY needs to provide background info to the players so that they know what is and isn't normal (and what options might be out there). Lack of depth to Non-player characters: Most Pathfinder APs have some NPCs that are richly fleshed out in the book, are given enough of a background that the GM can breathe life into them with ease. In Dead Suns, none of the NPCs are given that kind of write-up. The GM has no context for why the Ambassador is doing what he's doing, or why Eskolar is where she is, or what kind of person Chiskisk is. The shorter length to the book is certainly partly to blame, but it also suffers from having to carry a lot of Absalom Station background instead of adventure-specific background. The adventure doesn't stand on its own: The players tackle disparate tasks that lead them to discovering that the drift rock has mysterious alien technology inside. The discovery plays no role in the resolution of the adventure, its effectively just there for flavor. As a result, there isn't much of an arc to the story here and there's no big villain. The players are left with a few mysteries, but very little to engage with until Book 2. The combats are dry: There are many encounters in this book, but almost all of them are straight-forward brawls: PCs and one to two enemies in an empty room or hallway, trading blows until one of them falls. The enemies fought are all simple (and most are unintelligent), with a single attack and very basic tactics. The environments are not conducive to interesting movement or positioning either. As an intro to the Starfinder system, its a good package. A simple adventure that manages to hit a broad assortment of the system's mechanics. Zero-G combat, starship combat, skill challenges, ranged and melee combat, diseases, etc. It covers a lot of ground! Laying the groundwork well. It does a good job of setting up the core concerns of the AP, though PCs probably won't realize it for a while. The Eoxian role in things, the corpse fleet, the Stellar Degenerator. All of these are teased or interacted with in this adventure. A good intro to the Setting: It keeps things basic, but provides the GM with enough useful information about Absalom Station to flesh out the world. Don't go on the asteroid! Yeah, what they said. Bimonthly? bimothly = 2/month or every 2 months? To clear this up: when we say "bi-monthly" on paizo.com, we are referring to "every other month." Also only 64 pages instead of 96 apparently. Technically, Paizo could shorten the APs. Much of what is being covered after the adventure ends is now being taken care of in the Campaign Settings, Player's Companions and Pathfinder Tales. Hmm, this AP will have the same "ancient alien weapon" plot as my Starfinder homebrew. My setting will be called the Alpha Sector. It's divided between three distinct regions: the Core worlds, ruled by the militarist and authoritarian Federation, the Mid-worlds ruled by the democratic and prosperous Republic, and the Outer worlds, an anarchic territory ruled by warlords, pirates, and smugglers. Basically, the players will have to race across the Alpha Sector trying to find components of the alien weapon before the evil Federation admiral Joseph Cain can find them. Hopefully this campaign will be different enough to where people don't accuse me of ripping it off. Classic scifi scenario, good start! Will this be part of a subscription, or do we have to order all Starfinder products individually? So hope there will be subscriptions to these also. And it's written by Rob McCreary!! I would be really happy if the Starfinder Adventure Path subscription turns out to grant Pathfinder Advantage as the Pathfinder Adventure Path subscription does. I'm hopeful that the 64 page mark is an indicator that there is no need to slog through unnecessary filler encounters just to gain experience in order to be an appropriate level. Cut the fat and leave us clean, crisp story with exciting challenges. Could the "alien weapon" mentioned in the description possibly be the superweapon from Eox? 64 pages seems very bad and a serious area of concern. When Starfinder was announced the APs were supposed to be using the backmatter to fill in for the lack of a separate campaign setting or player companion line. Now they're shorter than a Pathfinder AP? When can I sign up for a subscription to this? Finally, an Absolam based adventure path!! Was it ever confirmed that Starfinder APs will only be six issues long like the PF APs? Maybe they are trying a different model. I'm assuming six issues, since it says, "Dead Suns 1of 6" in the page title. I'm ok with one AP/year for this. The number of support products makes me lean towards realistic rather than tentative in describing the rate of release. I'd prefer they err on the side of caution rather than promising the moon and finding themselves falling behind. I daresay the incidence of hysterical giggling/sobbing coming out of Sutter's office has gone up markedly in the last few months. I'd bet any money there will be a new subscription. It definitely won't be part of the Pathfinder AP. The safest thing to do is to preorder. In general, if you add a preorder and then a subscription comes out down the track, their system is clever enough to realise that you probably want to cancel your preorder so you won't get it twice. Nah, I get that. It's just a slower delivery model than what they've done with PF. I'm a little disappointed it isn't 96 pages though, especially given the price tag. Less ambitious page count and lower print volume, I guess. No doubt. It did seem to me that intitially they were only going to do the core book and then expand the universe via APs. Now there are books like The Alien Archive (the bestiary-equivalent, I believe) I wonder if they've rejigged the idea and scaled back the AP size accordingly to save content for other products. Wait, is Robert G McCreary a Space Fantasy pseudonym? Doesn't he usually just use Rob McCreary? Please excuse my incoming skeptical post, I'm incredibly excited about the first Starfinder AP, and am really chomping at the bit to get to know the story and universe that's being built. I do have some concerns and thought I might voice them. I'd be fine with bimonthly 64 page adventure, but the cost of this book is only about 8% cheaper than the cost of a 94 page book. While being roughly 30% smaller. Then when you consider that there's a bunch of backmatter content, it's not really a 64 page adventure. Looking at the most recent Pathfinder Module "Seers of the Drowned City", the "Appendices" or backmatter start on Page 46, the adventure starts on page 4. Leaving roughly 42 pages of adventure content, and 18 pages of backmatter. I'm not worried about being shorted adventure content (I'm confident that I can pad and expand adventures myself), I'm worried I'm not going to get enough backmatter! Since it's been stated that the Adventure Paths will be the primary method of delivering new lore, rules and monsters to the setting only 18 pages of backmatter might not be enough to get the job done. There's an entire universe to explore in Starfinder, and as a GM I thrive on having more content to build and expand on for my players. To make the universe feel lived in rather than roughly scribbled as we go. So understand that my issues are only coming from a place of being a bit greedy for content and worrying that I won't feel satisfied with the morsels being delivered when I'm hoping for a feast. My initial reaction to 64 pages for 22.99 was: "No thanks." But i will definetly buy issue #1 and look how it is. Lots of previews will be necessary to build up interest and let people know what to expect of this. The print run will obviously be lower than the one for an established product like Pathfinder (which is in the low quadruple digit numbers - 2,000 minimum, but i estimate it to be around 3,000 for most APs). For Starfinder it could be 1,000-2,000 for issue #1, definetly lower for issue #6 (1,000 maybe), so a quick sell-out for issue #1 is a possibility. I think the page count for a 2nd AP (if there will be one) will rise IF the first one sells enough copies. The price likely won´t go down, but will more likely go up to 24.99 along with the page count from 64 to 96. To me it is obvious, that this is an experiment which depends on sales numbers. The decision to remove the creatures from the AP Bestiary (if true) and put them in "The Alien Archive" (where did you hear that, Steve?) would be a mistake imo, as a Bestiary style book should be available earliest after the first AP, even if these books tend to sell very well. There was a lot of speculation in my comment above. This was where I first saw James Sutter reference the Alien Archive which I understand to be the bestiary equivalent. When Starfinder first came out, my impression was we were going to get a CRB plus monthly APs (which would include setting material). Now that APs are going to be bimonthly and 64 pages i was speculating that perhaps that indicated a shift in approach to APs+setting books. I haven't heard anything official confirming that though - I'm just trying to read the tea leaves. It's been stated, in the last year or so, that there are still between 500-1000 charter PF AP subscribers. I think your print run estimate for the PF AP is low. An evil ancient item able to cause death and terror? Being chased by death cults and undead? So... its Mummy's Mask in space? How is it possible that you have a woman with purple hair on the front cover? Isn't Golarion's moon gone with Golarion? It should be noted people already pay 22.99 for campaign setting books, and the module line is 24.99 and also has 64 pages. How dare you use facts and reason, sir?! Do you not know that this is the Internet, where such things have no place? I am most disappointed, especially from a fellow of such exalted rank, most disappointed indeed. I wonder what this is going to mean for high level Starfinder play. Since they've indicated that all casters are now 6-level casters, I assume that means play will still go to 20th level. But 64-page adventures won't even get to the level 17 of the 96-page Pathfinder adventures.